1-6, The Giants should hang their heads in shame! Sad that our Jints aren't doing all that well. But at least the Islanders have a 4-0-1 home ice advantage to start the season. Warren So happy for you. What an honor & Great experience!! What s great memory to have.. Hi Richard We’re here rooting for the Dodgers, But the Astros are something else. May the best team win!! Hope everyone is well. It’s 8:50 pm I think the trick or treaters are Done for the night.. Good night, friends.. I am hanging my head in shame after today's Giant debacle. Come on Folks. This is not a one man show??????????? Hey Son, My wife & I are living proof that Brooklyn is God's country. We met in Sunday School (Church) Sang in the Choir together and have been married for 57 years after marrying in the Church on 12th street. Remember when they called it the city of Church's? 1 on 9th Street, 1 on 12th street, 1 on 13th street, 1 on 15th street, one on Prospect avenue and so on. I did not even mention the ones on Avenues like Greenwood Baptist, First Reformed, Memorial Baptist, A Synagouge etc:. We did have more Church's then Police Precinct's back then! Nuff said about the giants. Sad, Sad, sad! My reading of late consists of a Woods "Stone Barrington" novel (not his best) and some crazy science fiction character on Carol's Kindle. Not much to brag about but I keep looking. What does "COLD" mean. Cool I understand but "COLD" is no longer in my vocabulary! COLD is below freezing and we seldom see that. In fact lately anything below 75 degrees is cold. oh well I tried to post a picture but no go..
Did it!! 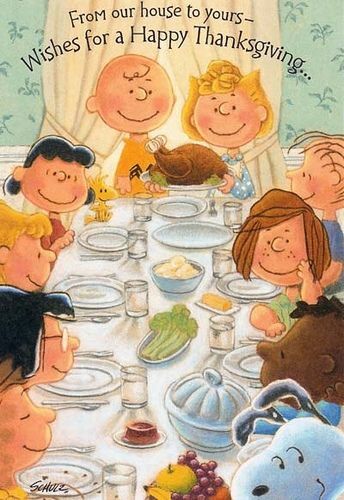 Have a Blessed Thanksgiving! Quite a week for me. Birthday on Tuesday, Thanksgiving today. Okay all you eaters, get started on that bird and all the fixings. Happy Thanksgiving to all of you. If you had the best record in your league you played in the World Series. Now there is a plethora of playoff games before you get to the World Series. You do not think MONEY has anything to do with it, do you? How I long for those great old days of real baseball! A wonderful 'Toikey' day to all. That's how we used to pronounce it in the old days. And Go Giants!! They went the wrong way again! Hi guys Happy birthday warren!! Mine is tomorrow!! Glad you all had a great “toikey”day!! Watching TV now & relaxing... Tomorrow dinner out & back home for some homemade Birthday cake & presents... What happened with Eli Manning?.. Is he now a bench warmer?? Ok back to some good tv. Have a great night!!! Warren, I’m reading “The people vs. Alex Cross” Excellent reading...I was #175 on list at library. Took Almost 3 months until I was able to get it. “Missing” by Patterson was a good quick read. HAPPY BIRTHDAY BACK AT YOU patsy!!! The Manning thing is a farce. When they fired Coughlin they should have fired his whole staff. Keeping them on duty is D U M B. Manning led them to 2 Super bowls. He is a very hard worker. Plays with no thought being sent out to him on the field are not his fault!!! Have not found any new Patterson books here lately. Guess I will have to go to the Public Library. Jints will now have a new coach as McAdoo was canned. Hopefully, the management team will be altered so that the entire team can be strengthened to the level that is was in the old days. Enjoy your December as the best part of the year is yet to come. When they dumped Coughlin his entire staff should have gone with him. I blame the GM for the whole fiasco and Mara has to take some of the blame for leaving him on the job. Good start, now get rid of the rest of Coughlin's staff! Steve Spagnuolo as interim head coach - long career but never stuck around for too long in one place. Hopefully, this will lead to team success. Hi friends Hope everyone is in the Christmas spirit? I’m just about done with gift shopping, now I have to take care Of food shopping..it’s exhausting..but it’s a wonderful time Of the year. Hi Dac545 Welcome! I don’t know who you are?? R U a park sloper from back in the day?? I’m originally from 20th street but now reside in Bay Ridge, Brooklyn.. Hope you come back & post on this blog.. If not, have a very merry Christmas & a healthy new year. Warren, I think I read all the Patterson books. This last one, did not have a summary of the next book or Title. That summary & title move me to get on waiting list At library.. The people vs. Alex cross was awesome!! This is the last book out by him so far, as far as I know.. Everyone.. have great night..keep posting! Happy Chanukah! And GO GIANTS! I have been off line for awhile. My computer key board died. My son got us a new computer so I should be back regularly. Until the rest of the Giant housekeeping takes place, I do note expect to see much of a change. Patsy, I can not get Patterson books in our in house Library. Going to have to go to the regular public library to get them. They are too expensive to buy, even on KINDLE. Merry Christmas and happy holidays to all! Older80Goat, are you familiar with the Overdrive app? The app allows you to borrow ebooks from your local library (if the library cooperates with Overdrive) to read on your Kindle or other device. ‘MERRY Christmas’ friends.. & to all who help us to keep this blog going.. have a healthy & happy new year!! Happy holidays and Merry Christmas, everyone! May your holidays be filled with love and joy. Happy Holidays to all. My Public library is quite convenient. We have Kindle but I much prefer to read from a book. Going to Christmas Eve service tonight with a group here at our Independent Living Facility. They are taking us on a bus. We are going to the local Church I have belonged to for many years. Watching some football this afternoon. No, not my Giants. We mersyfully only get them occasionally. Happy New year (early because I will probably be too busy cooking tomorrow to go online) !! Glad to see that all is well for everyone. Well, our Jints didn't do all that well. But as we always said in Brooklyn ~ wait till next year! It's been awfully cold here in St Paul. In fact, the temperatures have gone absolutely Polar. But that's ok as cold temps are good for you by keeping the blood circulating. Everyone have a Fabulous New Year! It’s pretty cold here too... in the teens. Which may not seem cold to folks in the twin cities, but New Yorkers aren’t used to such low temperatures. Happy new year to all! Have a healthy & happy New Year, To all!! A blessed & Happy 2018 to all. Hey Patsy, The people VS Cross was a great book. Glad to see Patterson back to his old self. Notice comments above about cold. We are freezing in Florida. Temps in the 30's & 40's are not what we are used too. I don’t think we have any control over the fonts you see on your screen. You should be able to adjust the font size on your computer monitor. Sorry! As for fonts size, I usually press CTRL and the + key in order to increase the size. Makes the print more readable. Hi guys Warren I’m glad you enjoyed that book.it was awesome!! Just wanted to pop in & say hi to all. We’re expecting some snow tonite. Everyone, have a great night!! Finally warmed up here in Sunny Florida. I am having a lot of trouble with side effects from an anti-cancer drug I am on. Will see my oncologist tomorrow. Hope he has some answers. Get well Goat! That was some Super Bowl - great win for Philly. The weather is cold here in the Twin Cities but our hearts remain warm. Take good care! Hi guys How is everyone?? Warren I’m on waiting list for NYPD RED ALERT & FIFTY/FIFTY both By Patterson. Just finished reading 2 Danielle Steel books. Ive been busy this month with work & enjoying family & friends at different functions. This month is flying by too!! Easter is just around the corner.. Early this year on April 1. I’m not a patriots fan per say, but I did root for them this year. It was a great super bowl game.. one of the best i’ve seen.. I think it was a disgrace that Philly fans would destroy property & loot In their own Community after they won!! Imagine, if they lost? Ok, just wanted to say hello & have a great night!! Hey Patsy, those Patterson books soundgood Sorry, can't agree with you as far as the New England Cheaters are concerned. I do not condone violence for any reason but I would root for the Devil before I would root for the Patriots. Baseball will be upon us soon. Spring training has already started down here. We are cool in the AM but the afternoons are in the 80's. If the Yankees can get everyone healthy, they will be a force to be watched! I do not know if the Met's have improved themselves or not. Only time will tell. I still feel lousy and the dr's are blaming it on the Prescription Drugs I am on. Since they put me on those drugs I hope they know what they could do to me. I am reading a Woods book entitled "Fast & Loose" Carol thought I read it already but I do not think so. Either way I am enjoying it. I have discovered that the well known, big seller Authors write the way I like to read. Afternoons here have been very warm for February. The Spring training should come off real well. Here in the Tampa Bay area we are still wondering who will be left on the "Rays" when the season starts. They have traded or released most of their "STARS". They are looking to build a new Stadium in Tampa and get out of St Petersburg. They have the lowest attendance in Baseball. looks like I am talking to myself!!!! Come on guys. Join in! Thanks MOD, but no thanks. I do not want to be a part of Facebook. it is a privacy thing and very personal!!! Should I say Goodbye and leave "Brooklyn Back When".? No one seems to want to join in!!!! Hi guys I’m here!! Just so busy with work & family.. Hi Warren. I just finished fifty fifty by Patterson. Good book!! Can u believe he is coming out with a book titled “the President is missing.” The best is the co author for this book Is Bill Clinton! This book should be something else.. His other new book Red Alert is out. I’m on waiting list for that too.. It’s part of NYPD 1, 2 & 3. I enjoyed those books a lot. I hope you’re feeling better by now. Did the doctor change your medicine? We are in the midst of a nor’easter. 2nd one in a week. It’s snowing like crazy here. Ok, folks Have a great night. Keep posting!! This storm has been crazy: rain, snow, slush, thunder, rain then back to snow. It will make for gross sidewalks tomorrow. Hi MOD IT was sheets of ice this morning! very scary to walk. slow going.. but this afternoon, the ice started to melt. now its turning to slush.. have a great night!! Sorry to hear of your bad weather. Patsy, I am only feeling a little better. Dr has taken me off MEDS that we think is giving me most trouble. We will have to wait and see. There is a withdrawal problem with this med so we will have to wait and see. Having trouble finding the books I want. Hi Warren Hope you’re withdrawals are subsiding with that medication you were taking. Sorry to hear you’re having trouble Getting books u want to read. Enjoy your day & day hello to Carol from me. Watching the Mets vs Houston game on tv right now..
Hi Patsy, Carol said hello back at you! I am still feeling crummy. Not sure why. Have an appointment with my GI Doctor on Wednesday. Hope he can find the cause of my nausea. A tree fell on my son's house in Wanaque NJ. Not too much damage to report so far!!! Hi Warren Glad your sons house is ok & no one was hurt!! Well, this last storm was a tease. Snow didn’t stick due to weather to warm & ground was wet from rain that Came before the snow. Have a great night & stay well. Hope your nausea subsides soon. going to G.I. Doctor today. Hopefully he can come up with some reasons and perhaps a solution to my problems. Been to the GI Doctor. Next week he will perform an EGD and try & see what is causing my distress. While I am not true Irish, some Northern Irish is in my backround. We will have a St Patty party Saturday night here at my Senior establishment. there will be singing, dancing, drinking and eating. Very moderatley on the drinking part! Happy Easter back at you Patsy. I was beginning to think the Blog was dead. We are still spending most of our time at Doctors appointments. I saw my Hematology Oncologist yesterday. He feels I am doing okay in his field of endeavor. Now if my Cardiology team could feel the same. Having a tire problem with our new car. I get messages on the dashboard telling me I have a tire low on air??? Please make sure you have each other's email, if you don't already. I'd be sad to see you all lose touch after such amazing years. Congratulations to those of you who used to be on this BLOG but have wanted us to switch to Facebook right along. You have won the battle. Especially those who objected to me being on here since I did not come from the exact neighborhood that many of you came from! To the victor goes the spoils!!!! Mamacita, thank you for all the support you gave this blog! It has been a pleasure dealing with all the administrators. Thank you all!